This worn out phrase kept ringing in my head during the last couple of hours of the UTMB®. It was simple enough to understand, yet powerful. But there wasn’t much pain and suffering, at least not the physical kind you would expect from running for almost 46 hours. The mental game however, was overwhelming. On and off, up and down, following the rhythm of the ascents and descents — my mood and my thoughts about myself and my capacity kept shifting. 171 k, 10059 meters of elevation gain, extreme heat, thunderstorms, sleep deprivation and hallucinations. My journey to the finish line of The Ultra-Trail du Mont-Blanc® 2016 sure wasn’t a pretty one. But the way every descent filled my heart with immense happiness made it all worth while. Being an ultra runner has never been what’s defined me. Being a downhill runner now is. 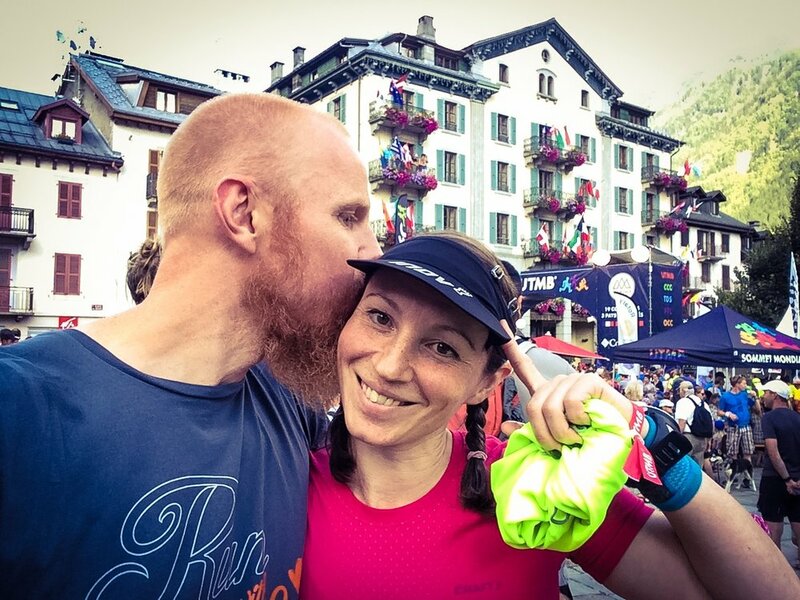 At the starting area in Chamonix, just minutes before the start. Last year, I failed already after 50 k. Due to the strict cut-off times, and me not having a particularly great day, I didn’t make it to Les Chapieux on time. This year, I wasn’t gonna let that happen. I got off to a really good start, starting just behind the elite runners. I remember how heavy my backpack felt last year, and this time I almost didn’t notice it. Everything felt just right. Sure it was hot, but the sun was setting and I knew it would soon get cooler. At the first checkpoint with a time barrier, Saint Gervais, I had almost a 1-hour margin. Johnny was there, but I only had time for a quick kiss, ate some oranges and bananas and then went off again. Me in the pink t-shirt. All the guys were looking like pros, rather intimidatiing. Photo credit Gen Novak. But pretty soon after I’d had the fruit, I started feeling nauseous. Up until then, I had stuck to my energy plan, eating something every 20-30 minutes. Now everything started to slow down. I felt worse by the minute, and eventually I sat down and started to vomit. After that I felt better, but still felt very faint and dizzy during the uphills, but could run pretty alright on flats and downhills. When I saw Johnny again at Les Contamines, I hadn’t eaten anything for the past 2 hours, I’d only had small amounts of water. I knew this was it. This part was the make it or break it point for me. This was where I had timed out last year, where I had lost all my hope and started walking on the flats and downhills. This leg starts with a crazy uphill. 1337 meters of ascent followed by 936 meters of descent. Well, first you run about 4k on flats, but that only counts as transportation. When the path narrowed down to a rather technical single track, I managed to get into a good procession of runners. People were moving well and I just had to focus on keeping my spot. What was even better; after a while I found myself walking behind a huge guy — tall, lots of muscle and a strong determined stride. He looked as if he was as strong as the mountain itself, and that image became very alive to me. So I decided to draw strength from him. For almost two hours, I stayed behind him, overtaking runners when he did, never letting anyone pass us. When we reached the top, I walked up next to him — this guy that was easily 2,5 times my size, whom I had only seen the back of — and I thanked him for lending his strength to me. He looked startled but also happy, as if he hadn’t had any idea about what had been going on two steps behind him, for the past couple of hours. At the beginning of the long descent, there’s a timing point (Ref. Croix Bonhomme). I decided to try and make a fast downhill run, to see how much faster I could run these 5k and 900 meters of descent now. Last year, this was the very place where my race ended. Then I thought this part was very technical and full of slippery stones. I remember how the descent seemed too steep and just way too technical to run. But now everything was different. I put on loud music and started to run. Earlier in the race, when going downhill, I had asked people to let me pass. Now I didn’t have time for this. Instead I passed them on the side of the track. I literally flew downhill, having one of the absolutely best moments of my life, feeling so connected to the ground, the pitch black night around me, my body moving forward and my feet not slipping once. I felt extremely alive. I gained 200 positions on this particular descent. I just couldn’t believe how everyone was so slow (just like I had been last year). It took me exactly 40 minutes to get from Ref. Croix Bonhomme to Les Chapieux, only 10 minutes slower than the female winner. Not too bad! And there was Anton Krupicka at the Petzl station at Les Chapieux! I started out from Les Chapieux just before the morning broke. Seeing the first morning light was a wonderful feeling. Running above the clouds, knowing that somewhere down there was Courmayeur, where I had my drop bag and where I’d get to see Johnny again. Since I still wasn’t eating much, I texted Johnny and asked him for some real food, like sushi or whatever he could get, but when I got there, it turned out he hadn’t gotten my message. Stopping at Courmayeur took way too much time. 40 minutes went by just like that, and I didn’t use them for anything important. I changed T-shirt and socks and reorganised things in my backpack, I guess I had something small to eat, but apart from that I can’t remember what I spent time doing. Just sitting down, I think. I fell into sort of a void after Courmayeur. I had looked forward to some rest there, some food, being taken care of. But that place was too stressful, nowhere to rest and people everywhere. So I set off on the second part of the journey with the feeling of missing out on something. There was something I should’ve done but hadn’t, or something I’d forgotten. The long ascent that started here (about 1200 meters) was probably the most difficult part of the whole course. It was so hot, no natural streams to cool you down, steep and technical and it never seemed to end. This was when I called Johnny for the first time telling him I couldn’t do it. He told me to walk for 5 minutes, then rest, walk for 5 minutes and then call him again if I still felt bad. It worked and I moved forward, but I stopped to rest many, many times. My head was killing me with thoughts of how weak I was, and how everyone else was stronger than I. And I was certain I wasn’t gonna make it to the next checkpoint on time. Just like so many times during this race, it was supposed to be 5k but when I finally reached the next timing point, I had walked uphill for 7k. After a while, I started to ignore the distance, only paying attention to the meters of ascent/descent on my watch, since they were more accurate. Somehow I managed to reach the time barrier with just 10 minutes of margin, but now I was in a really bad place. Walking out of that checkpoint, I wasn’t feeling good at all. It was still very hot, I had stopped eating entirely and only drank coke from the aid stations. We were already on high altitude and now came another 900 meter climb to the highest point of the course; Grand Col Ferret. I was out of breath, felt dizzy and started feeling nauseous again. I had to stop very often and again I felt so slow. I called Johnny and he told me to hurry — to not stay too long on high altitude. I was freezing and for the first time I had to put on more clothes; the long sleeved spare top, my wind jacket and the waterproof Inov-8 Ultra Shell. Do you see that little yellow tent? That's the timing point at the summit of Grand Col Ferret. After the timing point on the summit, I once again knew that I had very little time to descend. Also, this was when the thunder and lightning started and we were a couple of people running downhill very fast, trying to escape the lightning. Heavy thunderstorm rain and everyone just wanted to make it to the checkpoint. Someone said they ought to call the race off, that this was too dangerous and that we’d probably be counted as finishers if we could just make it to La Fouly on time. Again with about 10 minutes of margin, I entered the checkpoint expecting them to say we couldn’t continue. But they didn’t. We had to continue. I got out of the tent quickly, so I’d still be in the race, and then I called Johnny to ask him what to wear. What to wear? What a stupid question! It was night time again and the thing was, I just couldn’t decide what to wear. And for some reason it seemed very important to me to get it right, so I called Johnny for advice. Funny how your head starts playing tricks on you in the most peculiar ways. Once I had changed clothes and started heading forward again, the checkpoint had closed and I found myself being last in the race. There was noone behind me that were still allowed to continue, and the road in front of me was all empty. Somehow this knowledge calmed me. Ok, if I’m last, at least I know where I am... I started moving faster and before I knew it, I had passed several runners. This was a night of hallucinations. Hallucinations and despair. The uphills never seemed to end, I saw all sorts of strange things — Pokémons moving, people dancing beside the track, yellow drop bags hanging everywhere in the woods and a thousand runners sitting down beside the track that never existed. By the time I reached Champex-Lac and met Johnny again, I had developed a system not to get too affected by what I saw. As long as I kept looking straight in front of me, I could focus, but as soon as I turned my head or allowed my eyes to wander — the hallucinations were there again. Johnny said that as long as they don’t speak to you, you’re fine. Having some french fries and coffee at Champex-Lac. This whole night was terrible. The rain had stopped, but the track was filled with slippery mud. Cow bells ringing, telling me the cows were close by, but I couldn’t see them (and yes, for those of you who don’t know me — I’m afraid of cows...). In the middle of a long ascent, I decided to rest, possibly sleep for a bit. I laid down on my back and looked up at the stars, and started dreaming with my eyes open. Something happened here. I felt how the forest and I, the stars and the sky — we were all made up of the same energy. Everything was connected and I felt Johnny’s presence and love. I had a sudden rush of strength and determination, got up again and when I had walked a few steps I realised that I was on the top of the mountain. I suddenly recognised this part from a recon run we did last year, and I knew that from now on it was mostly downhill all the way to the next checkpoint. Again I was full of hope and determination, knowing that morning would come soon and my head turned clear again. If I could run this long downhill very fast, maybe I could earn myself a rest, maybe lie down with closed eyes for 20 minutes in Johnny’s arms? 15 minutes with closed eyes in Trient. I told Johnny to try to charge my body with strength and love. And it worked! I did earn myself a rest, and the 15 minutes I had laying down was heaven. I used ear plugs but couldn’t shut out the noise completely and didn’t manage to fall asleep. But it was still wonderful. The next part, I had also run the year before, and I knew that it was a beautiful forest track, 850 meters of ascent followed by 890 meters of descent. I thought I’d have plenty of time, but again I was too slow uphill and now for the very first time, I had to use the forest instead of the toilet at the next checkpoint. Up until now, my systems had worked so well and I could easily wait for the next toilet, but suddenly everything broke down and I had to stop several times. I called Johnny and told him that when I got to Vallorcine, I wouldn’t need any new food or anything (I wasn’t eating from my stock anyway), I only needed information. I was too tired to understand what I had written on my cards and I needed to know exactly how far it was to the next time barrier; both in terms of kilometers and meters of ascent/descent. I made a quick stop at Vallorcine and headed out into the emerging heat once again. Only one mountain left, only one big uphill and then a long and technical downhill to the finish. Or so I’d heard. Great camouflage! Dust and mud, sweat and tears. The last uphill; 900 meters of ascent, was extremely difficult for me. At this time, I wished I’d had poles, but in hindsight, this was the only time I longed for them, so the decision not to use them was probably right. Again it was super hot, there was very little water to cool you down, and I had to use my hands in order to move upwards. Maybe this uphill isn’t one you need to use scrambling techniques at on a normal day, but this wasn’t a normal day. I couldn’t look at anything that was moving, like cars or the little valley train, since it set off a series of hallucinations each time. Keep looking straight ahead, don’t look to the sides, don’t look! I wanted to call Johnny again, to tell him I wouldn’t make it, but suddenly there was this shift. Despite the heat, despite the fact that I felt so slow and disorientated and despite my sudden urges to find a bathroom, I found myself getting focused again. I was so close and had fought for so long and I wouldn’t let it slip out of my hands now! So I turned off the phone and tried to understand how far I had left. The checkpoint at La Flegere closed at 2:45 PM and I knew it would be close. I saw the checkpoint in the distance and had about half an hour to get there. Now there was some 300 meters of descent, which was what saved me. Downhills I can run! And I can run fast! There was a lot of people on the track at this time, both runners participating in the race, and lots of hikers going in both directions. This of course made it more difficult to move fast, but I did my best. Luckily the hallucinations completely stopped once I got my focus back. I remember thinking to myself that hey, no time to find a good toilet spot now, and if I have to go I simply can’t. I’ll have to run. No matter what. Pain is temporary, glory is forever. Just. Keep. Running. Apparently, the update on my making it to the checkpoint was late, and Johnny thought I’d missed it. But I had made it, with 12 minutes of margin. During the days it was 30 - 35 degrees C.
The sign at La Flegere said 7k to Chamonix, - 900, + 0, which meant there was only a long downhill left. For the first time I believed I was gonna make it. I truly believed I could do it and I ran down, down, down with a big smile. I talked to runners that I passed, cheered them on, telling them that we would make it, we had made it! A lot of the other runners were walking by now and suddenly it hit me. If you walk all the way down in that pace, you’re not gonna make it. I picked up speed even more and gave thanks to my legs, my super-strong legs, that despite having carried me this far, were still up for one last downhill run. Of course I was tired. Of course my legs were tired. But I didn’t notice it. A long, steep, and at some parts very technical descent, and I just loved it. Finally in Chamonix! Photo credit Gen Novak. Johnny met me about half way into town. He started screaming, crying and then talking, all at once, and I had to tell him to be quiet, because I had to focus. Coming into a town full of people, feeling the heat of the asphalt and knowing it would soon be over — it all made me very lightheaded and I felt like I was going to faint. When Johnny said it was about 500 meters left, I stopped running and started walking instead. 500 meters was way too long, I just had to rest for a few steps. Walking... Only 500 meters left of this crazy adventure! I had imagined the finish a thousand times during the race. How I’d cross the finish line and just fall down on the ground, not caring about anything or anyone else. Not caring if I was in the sun or the shade, or if I was in the way of someone else. They would have to carry me away. But when I finally, finally reached the finish line of this beast of a race, it was too crowded. There was no room for me to fall down, so well, I guess I had to keep standing up for a little while longer then. People everywhere, but I got to hold on to Johnny. And reaching the finish line, my body filled up with this one emotion — emotion, thought and knowledge at once — that I’m a hell of a downhill runner. 2555 runners started. 258 of these were women. 1468 runners finished. 131 of these were women. Overall Rank 1378, Rank Women 119, Rank age group 52. I was awake for 60 hours straight. I'm 1 out of 3 Swedish women to ever finish the UTMB®. This year I was the only Scandinavian woman to finish. The course was longer this year than previous years. For some reason they had added an extra climb! I ran in Inov-8 RaceUltra270 — a brilliant shoe, no blisters or aching feet whatsoever. My UD Jenny Adventure Vesta was great, it really acted as a best friend all the way and didn't feel heavy once. I took a lot of BCAA pills, which is probably why I managed to run on almost no other energy. I took Magnesium pills on a few occasions. Never felt the need for pain killers, therefore didn’t use them at all. Between checkpoints I ran with 500 ml of water (night time) and 500 ml of water + 500 ml of coke (day time). I drank a lot of coke and some bouillon at the checkpoints. But mostly a lot of coke. I didn’t take any salt tablets, had some salty candy, 2 drinks of Resorb (electrolytes) and at one point I had plain salt. Writing autographs at the finish. What a moment!